We’d love your help. Let us know what’s wrong with this preview of Put Away Your Phone! by Tracy Bryan. 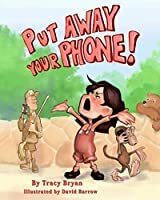 Emma is a little girl who notices that grown-ups are always talking into, looking at or fiddling with their smartphones. One day at the zoo, Emma decides to count how many people are on their phone. Follow Emma as she counts her way through the zoo. Help Emma shout PUT AWAY YOUR PHONE! to all the grown-ups she sees. To ask other readers questions about Put Away Your Phone!, please sign up. Be the first to ask a question about Put Away Your Phone! Love, love, love this book, it's great illustrations (look at Emma's and the animal expressions especially), the storyline, character and most of all - THE MESSAGE! 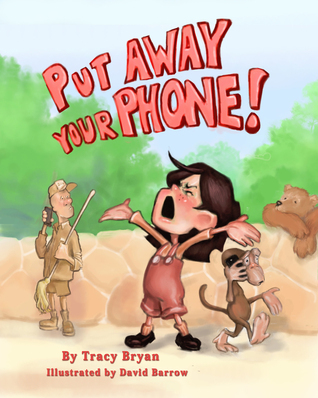 This story is told through the eyes of a child as she sees that smartphones are taking over her fun day at the zoo. Everywhere you look somebody is on one. This causes her to become very upset, but then something happens that makes her see and understand the need and use for smartphones. This story brings to light the need to find a balance with phone use. It is a nice reminder and warning to parents of how children feel about smartphones. Emma is frustrated because she thinks her parents use their smartphones too much. On a trip to the zoo she notices that all of the grown-ups are on their phones. However, soon Emma realizes that a phone can be very useful when you are in a bad situation. A good lesson for adults just as much as children. Pay attention to your kids because your time with them is precious! I received a free copy of this book and that is my honest review. Description: This book is about a young girl named Emma who is frustrated that adults spend way too much time looking at their smart phones. Her family goes to the zoo and her frustration grows making her distracted until she ends up getting lost. She gets an employee to use their phone to help her find her parents, in the process realizing the positive safety potential of phones. In the end she signs a treaty with her parents getting them to agree to give her the attention she deserves, and in Description: This book is about a young girl named Emma who is frustrated that adults spend way too much time looking at their smart phones. Her family goes to the zoo and her frustration grows making her distracted until she ends up getting lost. She gets an employee to use their phone to help her find her parents, in the process realizing the positive safety potential of phones. In the end she signs a treaty with her parents getting them to agree to give her the attention she deserves, and in return she'll work on her frustration. In Short: This is a super cute children's book that teaches both children and adults, the importance of giving your family your time and your undivided attention. Emma just wanted her parents to pay attention during her ballet classes and when on family outings, but they were always on their phones! Pros: I love the artwork, it is really awesome. The moral of the book is great. 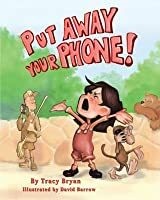 The moral may seem a little more geared toward parents than the kids the book is intended for, however it is good to start teaching kids at a young age how to be respectful and how to not hurt people's feelings when they reach the age where they have their own smart phones. This new digital age has created a new need to learn some social skills regarding when it is and isn't appropriate to be messing around on your phone. Even without a phone it is still important for kids to remember to pay attention to others when they are trying to spend time or communicate with them. It is also important for families to spend quality time together and show they care by giving proper attention. I loved how the book ended. Emma set some boundaries for her parents and got them to see how upset it made her that they were always preoccupied with their phones. If you have a friend who has children and also an addiction to their smartphone this could be a funny and maybe even eye-opening gift for them! It is also great for any child to help them have good social skills. Cons: I have no issues with this book. Bravo! It is wonderful to read a book that relays a message which so many people want to scream and shout about. These days, it is impossible to walk down the street safely any more without worrying that somebody who is looking at their phone might walk into you, ride their bike into you or even hit you with their car because of their smartphone! Tracy Bryan’s imagination in using a child’s frustrations to vent to the world is a genius method of getting that message across. Smartphones seem to h Bravo! It is wonderful to read a book that relays a message which so many people want to scream and shout about. These days, it is impossible to walk down the street safely any more without worrying that somebody who is looking at their phone might walk into you, ride their bike into you or even hit you with their car because of their smartphone! 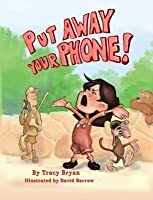 Tracy Bryan’s imagination in using a child’s frustrations to vent to the world is a genius method of getting that message across. Smartphones seem to have taken over people’s lives, replacing their computers, books, internet providers, cameras and more. I support Emma’s plight in changing their name to dumbphones. In the event of an emergency, it is near impossible to grab somebody’s attention when they are fully absorbed in what is going on inside their phone. I very much enjoyed Put Away Your Phone! and feel that it should not only be read by younger readers, but also by everybody who owns a tablet or smartphone, in the hopes that it might remind them that there is a world outside their phone that misses them. And that’s what Emma does in this story. On a trip to the zoo, she decides to count the number of people who were on their phone. As the number increases, her saying of “Put Away Your Phone!” gets louder and more noticeable. By the end, she shouts it to the world: “Put Away Your Phone!” Wise words we should all live by every now and then. I mean, c’mon, people! “Smartphones should be called Dumbphones.” Funny and cute! Illustrations were colorful and showed Emma in wild and animated gestures, clearly making her the focal point. I loved the animals’ expressions and gestures as Emma got more and more frustrated. Yeah, the animals didn’t get it either. Eventually she comes to realize how vital phones can be in an emergency. 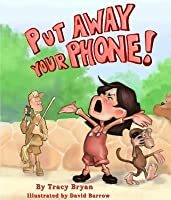 It's a cute book with a very good message that should hit home with everyone who has a phone. We are all on our devices way too much, there is no time left for the important things, family, friends, time away. We need to get off our devices and take time to enjoy life. The art work goes with the story so well, kudos to the artist. I would love to see more of his artistry. Good job to both the author and artist. This book is a good reminder for all of us who spend too much time doing things on our cell phones and not enough time paying attention to our children. Emma gets frustrated by all of the grown ups using their phones when it's not necessary. She just wants to shout, and she finally does. But in the end, a cell phone does help her in an emergency. Trivia About Put Away Your Phone!